Squash vine borers are pests of crops east of the Rockies. The adult is a moth that lays its eggs on the stems near the base of the plant in late spring to early summer. 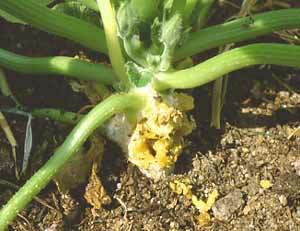 Fat, white caterpillars with brown heads hatch out and tunnel into the stems to feed, causing sudden wilting of all or part of a squash vine. If you cut open the stem of the wilted vine lengthwise, you'll find it filled with sawdustlike frass (droppings) and one or more caterpillars. The borer prefers squashes but will occasionally infest cucumbers and melons as well. In the Deep South there can be two generations per year; in the North, only one. Slit open wilted vines and remove borers, then cover the cut with moist soil to encourage the vine to reroot. Remove vines as soon as the growing season is over to interrupt the life cycle of second generation larvae. If borers are historically a problem in your garden, place a shovelful of soil at one or more locations along the vines to encourage more roots to develop. If a borer does infest the vine, these additional roots can help the plant survive and produce a crop.